Have a chill or feeling down? Forget that nasty canned soup. This recipe is so simple, you’ll never look back. 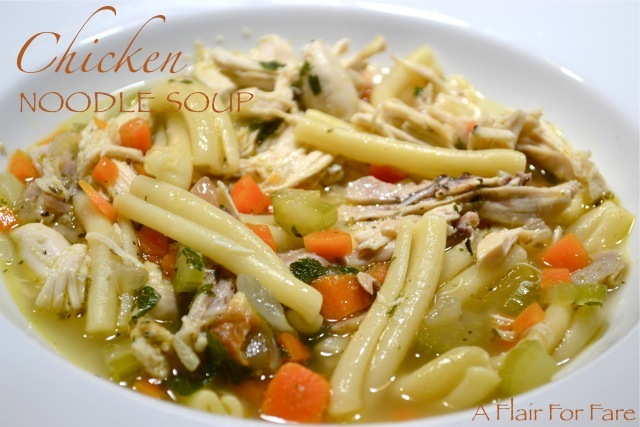 Made with a store bought rotisserie chicken or left overs from your own roasted chicken, this soup will cure what ails you, or at least make you feel so good you’ll think it did. Skin and de-bone chicken. Shred meat or chop into bite size pieces. Heat oil over medium heat in a large soup pot. Sauté vegetables until soft. Add broth and italian seasoning and simmer for 5 minutes. Add pasta and cook according to directions for al dente. Add chicken and parsley, simmer 5 more minutes. Add salt and pepper to taste. Yummy looking, and very timely! I woke up with larengitis this morning–I think the flu is stalking me–and my first instinct is to run to the market and buy chicken and veggies and whip up some soup tonight! Throwing a little pasta into the pot sounds like a great idea. Thanks!